Rising seas linked to climate change pose a major threat to coastal cities around the world. In southeastern Europe, the UK, US and elsewhere, recent disastrous flood events have led to calls for more effective flood control designs. Who better to turn to for ideas than the Dutch, who’ve been staving off flood for centuries? Over the past decade, Dutch engineers and planners have been designing innovative, nature-based flood control systems that are cheap, effective, and environmentally friendly. 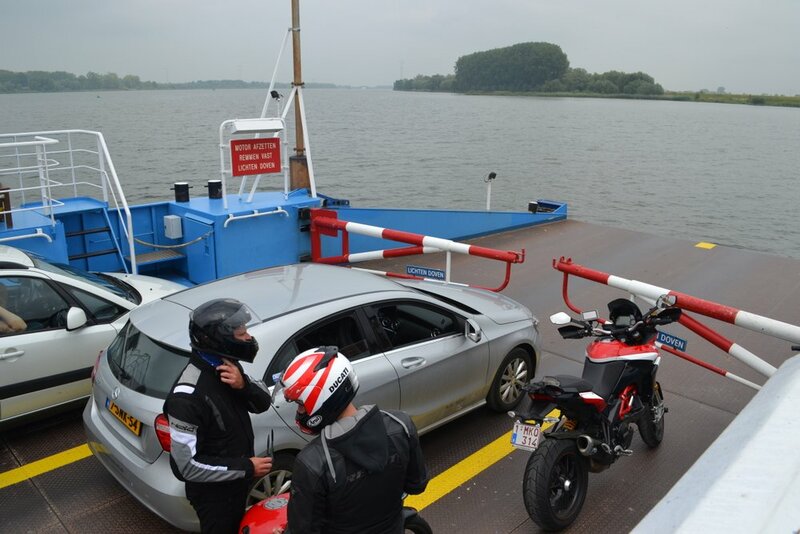 On a ferry across the Nieuwe Merwede, southeast of Dordrecht. Southeast of the flood-prone city of Dordrecht — near where the Rhine estuary flows into the North Sea — a new flood control design is taking shape. It’s part of a program called “Room for the River.” In 2016, a 23-kilometer stretch of concrete dike encircling the village of Werkendam, upstream from Dordrecht, will be breached in several spots, allowing the adjacent Noordwaard Polder to flood under high river conditions, thereby lowering river levels at Dordrecht. 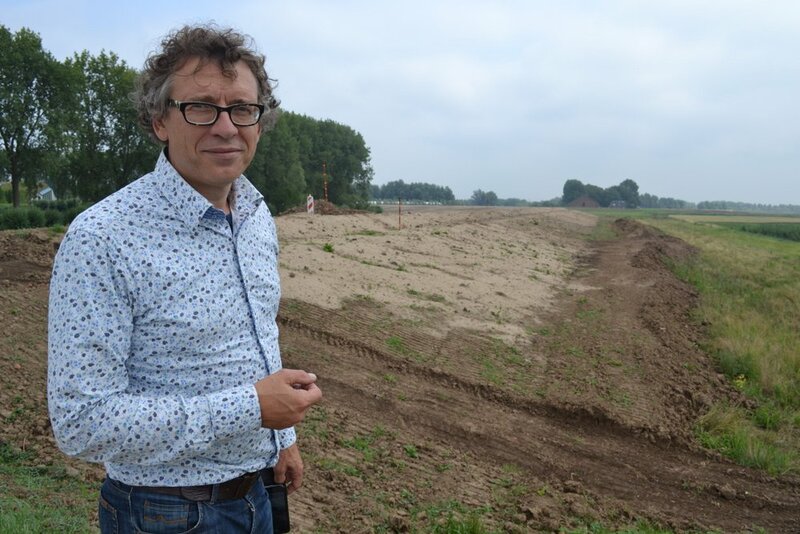 Werkendam will be protected by a new, 3-kilometer stretch of dike made of clay and grass and flanked by willow trees. The trees will lower wave intensity, thus allowing the dike to be both soft and low. Sheep will graze on it and flanking trees will provide bird habitat (a national park is located a few kilometers downstream). Mindert de Vries, on the outer edge of new “soft” dike near Werkendam. Another novel design feature of the dike is its gradual slope (see attached photo), making it largely invisible to people living behind it — and “unbreakable,” says Mindert de Vries, an ecologist and sediment morphologist with the Delft-based research institute Deltares, who has been involved in the new dike’s design. If waters do rise high enough, they’ll spill over the top of the dike, rather than break it, says de Vries. The icing on the cake: a clay-grass dike is cheap to build and has a small carbon footprint. No wonder the design has captured attention across the Atlantic. Mindert and his colleagues are proposing similar flood defense systems in New York City, Mississippi and Louisiana, in the wake of Hurricanes Sandy and Katrina. Mindert de Vries’ “soft” dike is designed to reduce flooding in the Netherlands’ Rhine estuary. Along the North Sea coast, an equally elegant approach has been used to protect the capital city of Den Haag. In response to projected sea level rise — and with the great floods of 1916 and 1953 engraved in memory — the Den Haag municipality and water board have given the seaside dike at the coastal suburb of Scheveningen a most innovative makeover. Scheveningen’s dike is centuries old — and for years a structure people could stroll down, past crowded beach-side cafes. The new dike is fully “multi-purpose” and recruits adjoining urban structures into its flood-control design. 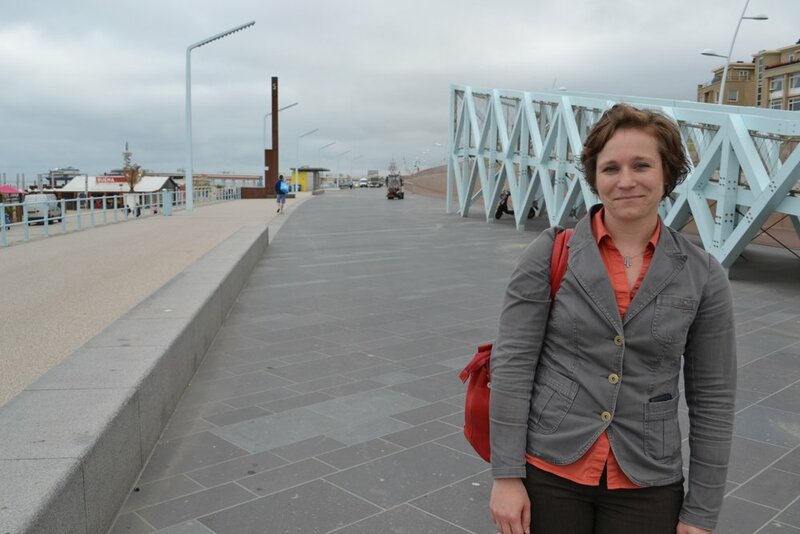 Ellen Tromp on Scheveningen’s new boulevard dike. Above the promenade — shaped in such a way as to reduce the force of incoming waves (by Spanish-Catalonian architect Manuel de Solà-Moralesa) — residential buildings, a vehicle route, dunes and a cycle path add storm surge defenses to an obviously vibrant living space. Beneath, pavilions and a widened beach add extra protective edge. I visited Scheveningen’s seaside boulevard in the company of Ellen Tromp, a multi-purpose dike specialist with Delft-based Deltares. Tromp helped facilitate the extensive public consultation process that preceded the boulevard’s makeover. Tromp and I strolled past a biodegradable bridge residents can use to get onto the stylishly-paved levee and over to the beach (a bridge designed to break up during storm surges, so it doesn’t damage the dike), toy structures adults can examine and kids play on, and Scheveningen’s renowned beachside cafes, all beside a much wider beach. 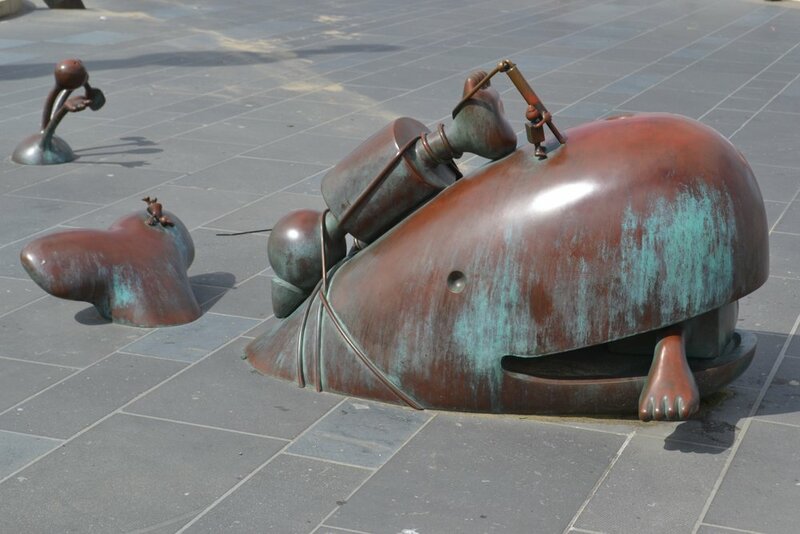 Listen to Ellen Tromp and Mindert de Vries in this audio story. At the end, Mindert takes me to Dordrecht, where I’ll catch a river taxi back to Rotterdam. First, I want to hear a few local stories about past floods. Mindert offers to find someone with tales to tell. 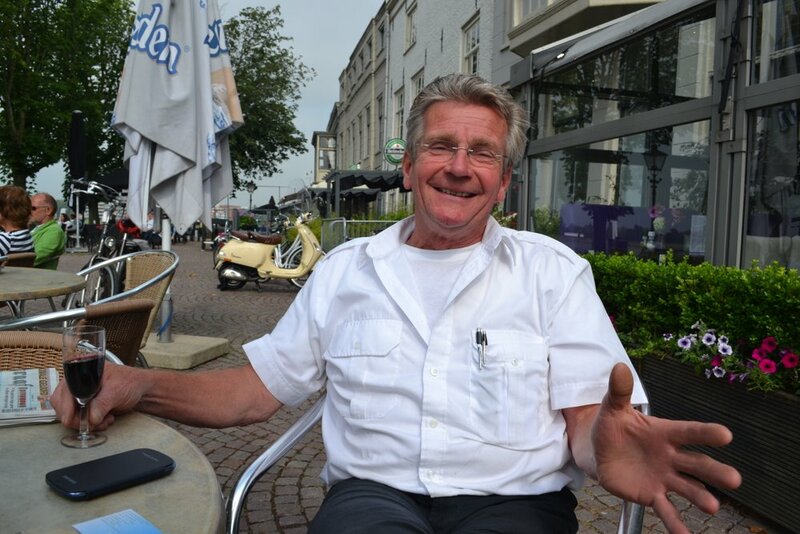 We end up sitting with a congenial gentleman named Ben Van Ginneken, at a cafe beside the Rhine, drinking wine and beer as huge container ships sail by. No one is more informed about Dordrecht’s flooding woes than Ben. Listen here.